WaterField Designs debuts its new Field Muzetto, a handsome padded laptop bag, just in time for Surface Pro 4 users whose new device ships today. Designed to complement men’s apparel and lifestyles, the Field Muzetto vertical messenger protects laptops and tablets in a padded pocket and features full-grain distressed leather accenting a lightweight and rugged waxed canvas shell. Available in three sizes, the small fits the new Surface Pro 4 and other daily essentials, the medium stows the Surface Book or MacBook Pro 13-inch, and the large holds 15-inch Macs or similar-sized computers. WaterField Designs, a San Francisco manufacturer of custom laptop sleeves, bags and cases for digital gear, manufactures all products in the USA. 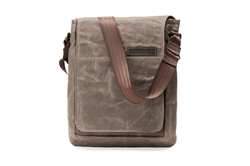 The Muzetto is a lightweight, vertical laptop bag with an adjustable shoulder strap. Every detail is engineered with form and functionality in mind. With an area for every item men carry, the Field Muzetto is ideal for both commuting and traveling. The bag includes a padded laptop pocket, a main compartment with a secure zippered pocket inside, a scratch-free pocket for tablets or other electronics with a soft smartphone pocket inside it, and an open-topped back pocket. A gold liner “lights up” the main compartment making contents easy to differentiate. The flap length and angled sides add to its svelte look. To reduce shoulder and back fatigue, a removable, shoulder pad with a gripping underside keeps the strap firmly in place. The bag hangs naturally against the body, and its clean and refined look complements any outfit—casual jeans to a dressy blazer. All three sizes are small enough to provide unrestricted motion, yet large enough to stow essentials and digital gear. The Muzetto: Price—Small: $169. Medium: $189 Large: $199. Small—$169. Dimensions: 11.5 x 9.3 x 2.0 inches / 1.3 lbs. Medium—$ 189. Dimensions: 14 x 11 x 2.5 inches / 1.8 lbs. Large—$199. Dimensions: 15.5 x 11.75 x 2.7 / 2 lbs. Colors: Lightweight brown waxed canvas with naturally-tanned, full-grain chocolate leather panel. Shipping begins, November 6, 2015. About WaterField Designs WaterField Designs is an innovative San Francisco designer and manufacturer of bags and cases for tech-savvy consumers who want to stylishly and responsibly transport their technology. WaterField manufactures custom-fitted, high-quality cases and bags for a full-range of laptop computers, smartphones, tablets, gaming devices and other digital gear. All products are manufactured to exacting standards entirely in San Francisco. More information at “Our Story”.